Fayetteville, West Virginia, United States. Total length of 924m with the main arch spanning over 518m. 267m above the New Rivers with a carriageway width of 21.1m. The New River Gorge Bridge was opened on the 22nd October, 1977. It was the world’s longest single span arch bridge since the opening until 2003 when 550 m span of the Lupu Bridge completed in Shanghai. Currently, Chaotianmen Bridge is the longest arch bridge in the world. It is still the longest arch bridge in USA. The deck of the bridge is 267m above the New Rivers with a carriageway width of 21.1m. It has a total length of 924m with the main arch spanning over 518m. Cor-Ten steel, with a rust-like appearance that never needs painting, was used in construction. The $37 million Bridge was a cause for excitement beginning with its June 28, 1973 award as the most expensive single project ever undertaken by the West Virginia Division of Highways and the Appalachian Development Highway program. 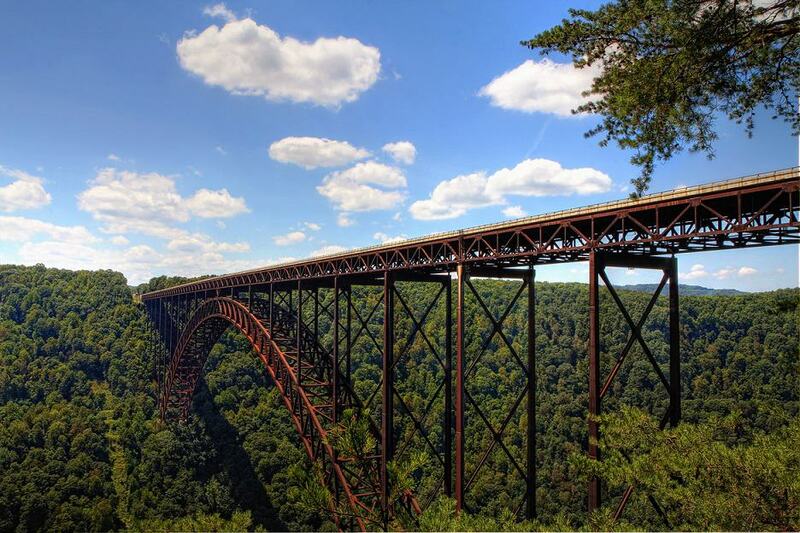 The New River Gorge Bridge was designed by Michael Baker, Jr. Inc. of Beaver, Pennsylvania. The bridge was built in order to link both sides of New River Gorge reducing the traveling time from 45 minutes to just over 1 minute. The Bridge required 4,759 design calculation sheets. Man hours for these calculations and drawings would equal 32,000 work hours. During a site survey an abandoned mine was discovered near the location of the foundations for the main supporting piers. If undiscovered, this could potentially have caused major failure to the bridge. There were 30+ Iron Workers hired to build the New River Gorge Bridge. Most of the out of town workers were “thrill seekers” who came to work on the Bridge because of its height. The average salary was $10-15 per hour. The New River Gorge Bridge expertly achieves the balance between simplicity and complexity. The simplicity comes from the single span arch allowing the viewer to appreciate the simple structure, whereas the more complex truss elements give visual stimulation. Rock anchors and injecting cement grout into pre-drilled holes in the rock face were used to stabilize the supporting valleys. Largest joint contains 2,300 bolts. 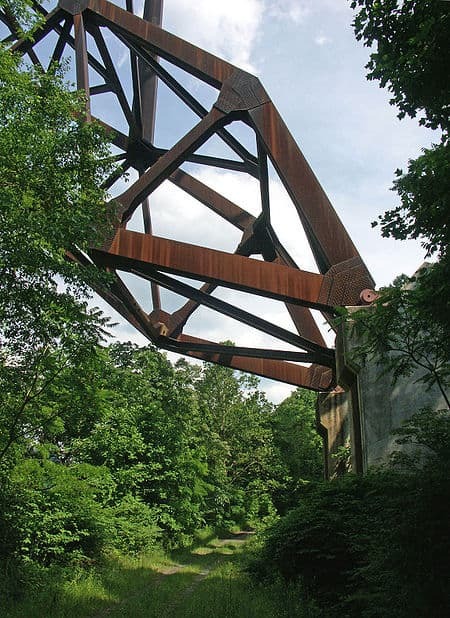 All of the steel members for the trusses were prefabricated in American Bridge Division’s Ambridge plant and transported close to site by river where they were loaded onto trucks and transported to site by road. On arrival at the site there were bolted together into segments. However, it was difficult to construct the structure over a deep valley. This problem was resolved by the contractor who decided to build a temporary cableway which was to act as a crane across the valley. Two 91.4m tall towers were built on each side of the valley to allow the setup of the 1524m long cableway. An initial light weight cable was lifted into place by helicopter; a stronger cable was attached to this and pulled back across the valley. The final cable was 76.2mm thick, due to its stiffness and weight; it was able to withstand the strong wind and the heavy load which it was later subjected to during the construction of the arch. After the completion of the arch, thirteen piers, which range in height from 7.92m to 93.0m, were built from the centre of the arch to the abutments. The deck of the bridge was constructed by using the cable way to lift the steel segments in place. Once they are positioned, the segments were connected through bolt groups. After the deck was constructed, the surface of the deck was completed by in-situ reinforced concrete. A total construction period of 40 months (from June, 1974 to Oct 1977) was achieved.